A total of 10 incidents of armed robbery against ships (comprising nine actual incidents and one attempted incident) were reported in Asia during January-March 2019 compared to 21 incidents (comprising 15 actual incidents and six attempted incidents) during January-March 2018. This accounts for a 52% decrease in the total number of incidents reported during January-March 2019 compared to the same period in 2018. The number of actual incidents has also decreased by 40% during January-March 2019 compared to January-March 2018. Both the total number of incidents and number of actual incidents reported during January-March 2019 are the lowest among the period of January-March of 13-year (2007-2019). The nine actual incidents reported during January-March 2019 were less severe incidents with one CAT 3 incident and eight CAT 4 (petty theft) incidents. There were no severe incidents such as CAT 1 and CAT 2. All incidents reported during January-March 2019 were armed robbery against ships. No piracy incident was reported. There were improvements at some ports and anchorages during January-March 2019 compared to the same period in 2018. The improvement was most apparent at the ports and anchorages in Indonesia; with three incidents reported in Indonesia during January-March 2019 compared to nine incidents during the same period in 2018. There were also improvements at the ports and anchorages in Bangladesh, India and Vietnam. 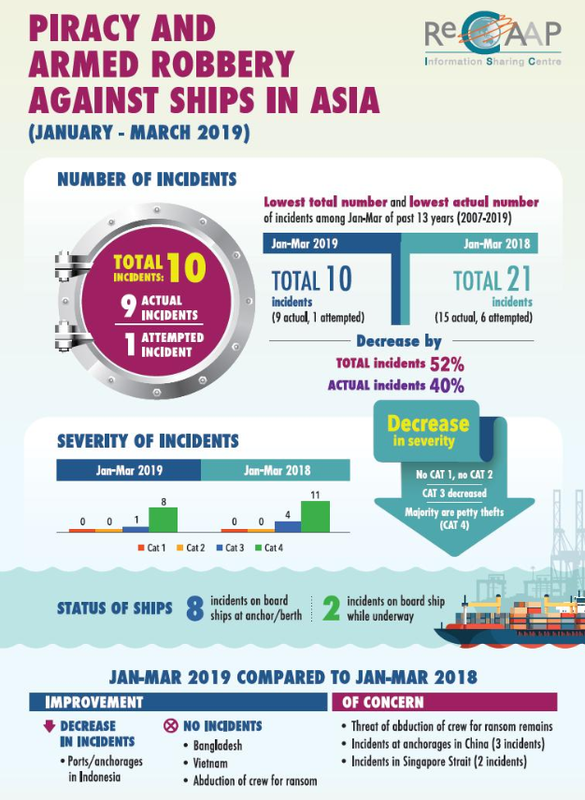 No incidents EXECUTIVE SUMMARY were reported at these ports/anchorages during January-March 2019 compared to three incidents reported in Bangladesh and two incidents each in India and Vietnam during January-March 2018. There was no incident of abduction of crew for ransom in the Sulu-Celebes Seas and waters off Eastern Sabah during JanuaryMarch 2019. Despite the improvement of the situation in the Sulu-Celebes Seas, the abduction of crew for ransom remains a serious threat in the area. Shipping companies are advised to follow the ReCAAP ISC’s Incident Alert dated 21 Nov 16 and maintain close communication with the contact centres of the national reporting centres. Of concern was the increase in the number of incidents at some anchorages in China and incidents of theft of scrap metal from barges while underway in the Singapore Strait during January-March 2019. The ReCAAP ISC reiterates the need for enforcement agencies to enhance surveillance, increase patrols and respond promptly to the reports of incidents. Ship masters and crew are strongly advised to exercise vigilance, maintain all round lookouts, report all incidents to the nearest coastal State and flag State immediately and implement preventive measures recommended in the Regional Guide to Counter Piracy and Armed Robbery against Ships in Asia.